Bergamot was known through traditional use of the fruit in Calabrian regions for decades as having beneficial effects in supporting and promoting health. Bergamot differs from other citrus fruits not only because of the composition of its antioxidant flavonoids, but because of their particularly high content. Flavonoids polyphenols such as Naringin and Neohesperin may assist maintain healthy blood sugar levels. Take 1 tablet twice daily fifteen minutes before meals. 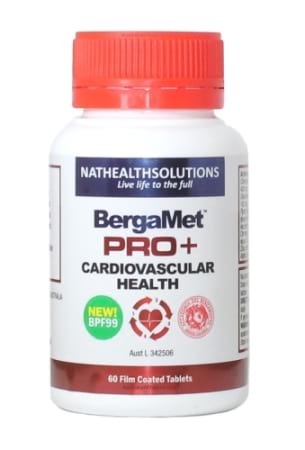 It is extremely important to take BergaMet before meals. Always read the label. Use only as directed. If symptoms persist consult your healthcare practitioner. As a precaution do not take BergaMet during pregnancy, or when lactating. 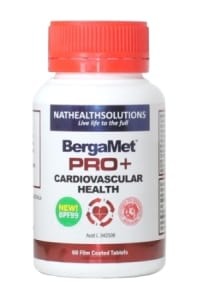 BergaMet is not for the treatment of high cholesterol, but may help to maintain cholesterol levels within the healthy range and maintain the HDL/LDL ratio. Blood cholesterol levels should be regularly checked. No artifical colours, flavours or preservatives. Free of wheat, gluten, fish, egg, dairy and lactose.